The Illinois Medical District (IMD) is a special-use zoning district located two miles west of Chicago’s Loop, consisting of 560 acres of land, with four anchor hospitals, medical research facilities, labs, a biotech business incubator, two medical universities, and more than 40 healthcare related facilities. Daily, the district welcomes 80,000 people: 30,000 employees and 50,000 patients, students and visitors. Fortunately, the area is well connected to transit by both the CTA Blue and Pink Lines and six CTA bus routes. While the mode share for transit in the district is fairly high—40 percent use transit, 50 percent drive and 10 percent use other modes (carpool, rideshare, bike or walk)—there is still tension over demand for parking and how to create stronger incentives for transit use. Some institutions within the district have strong policies supporting transit use. For example, the Veterans Affairs hospital pays up to $130 per month in transit fare subsidy and has the highest transit use of the hospitals – 65 percent of their 2,500 employees take transit. While most hospitals charge for parking, many employers offer free parking. However, businesses and institutions are realizing the area is at a turning point; they will need to charge for parking to make driving less attractive given limited space and expense. The IMD has big plans for growth and recognizes that transportation is a major aspect of its sustainability future. The plan notes that future higher-density development will be concentrated around transit stops and major thoroughfares. IMD owns significant developable land in the district, and for prospective tenants, transit access is one of the top three questions. According to a parking study completed in 2017, there are 21,000 structured and surface parking spaces in the District, and by 2025 there will be demand for 7,000 more parking spaces unless there is a major change in transportation demand management. Each parking spot is estimated to cost $30,000, and this anticipated demand for parking would result in an infrastructure cost of $200M. Currently, 25 percent of the IMD is dedicated to parking, which management acknowledges is not the highest and best use of real estate. To get ahead of the parking issue, IMD started convening a group of hospital and other stakeholders, including Chicago transit operators, to study transportation options. Getting to the IMD is not difficult but getting around within the district on transit can be challenging, and the hospitals currently run their own shuttles within the area. 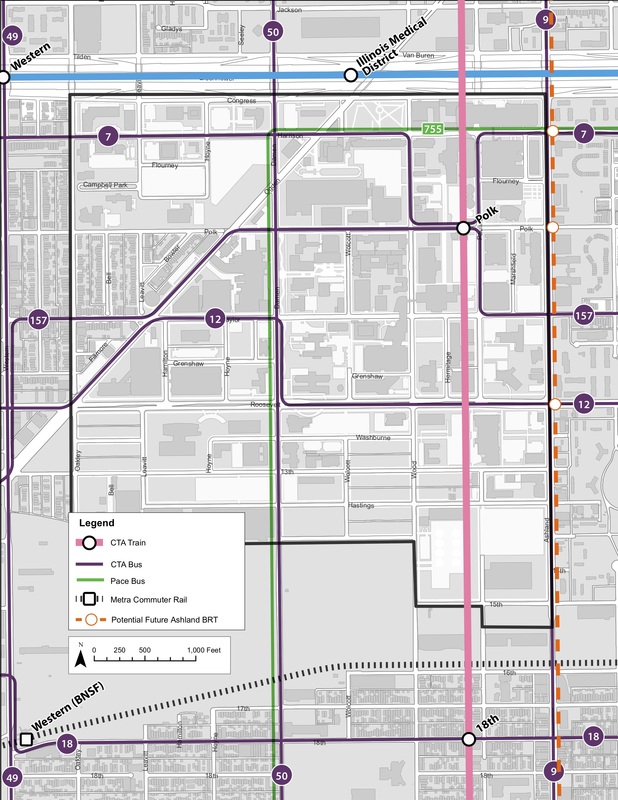 The transportation study recommended developing and implementing a new public transportation route within the district, connecting riders to major transportation nodes including the Blue and Pink Line stations and off-site parking lots. The IMD has been collaborating with the CTA to implement this new service, which is expected to launch in 2019. IMD plans for various institutions to contribute to the cost of the new CTA service, while enabling their employees to ride free, while the service would also be open to the public. The District is served by both the CTA Blue and Pink Lines and six CTA bus routes. Pace bus route 755 connects the Medical District with locations along the I-55 corridor including Plainfield and Bolingbrook.